Post Evergreen Line SkyTrain Preview? 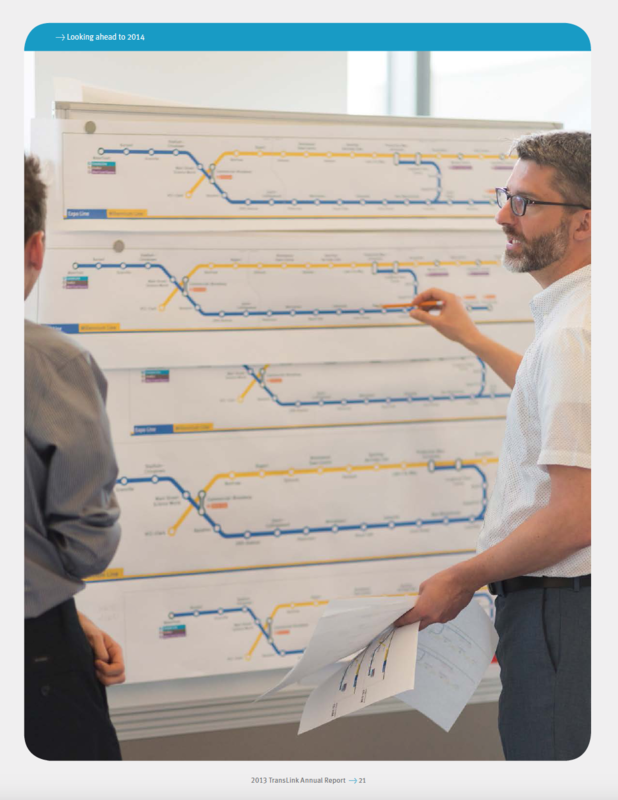 I came across this interesting (but unfortunately low-res) photo in the 2013 TransLink Annual Report (PDF). It’s worth noting that this photo is at least a year old and has no context, so what follows is pure conjecture. It looks like a generic staff-in-action shot, but what’s interesting to me is in the background. There are a series of strip maps being reviewed (either for station platforms or in-car above the doors) that appear to the SkyTrain system after the Evergreen Line opens (or, more accurately it seems, after the new extension of the Millennium Line opens). It looks like the Evergreen Line is to be absorbed into the Lougheed Town Centre – VCC-Clark section of the Millennium Line and the Expo Line will have two branches. One branch will take over a portion of the Millennium Line from Columbia to Production Way-University and the other is the current line that terminates at King George. Physically, it would make more sense to have the new Expo Line branch terminate at Lougheed Town Centre (with its extra platform). But SFU is a popular regional destination, and forcing people to transfer trains from Expo to Millennium for a single stop might not go over well with a lot of commuters. The part that pleases me the most about these changes is the Millennium Line loop no longer loops over itself. That should help reduce some confusion for users new to the SkyTrain system. Lastly, this means I have to update the map I was working on in the previous post.